Foraging New England, by Tom Seymour, 2nd Edition, 2013. Beautifully illustrated guide to identifying and preparing edible wild foods and medicinal plants, organized by habitat (seashore, streamside, forest, fields, etc.). Also includes a few edible creatures such as crayfish, bullfrogs, mussels and clams. 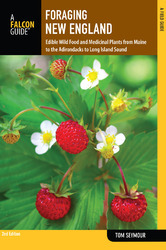 Includes numerous recipes and useful "Forager Notes." Illustrated with many color photos. 256 pp, 6" x 9".